This recipe is seriously… so… good. 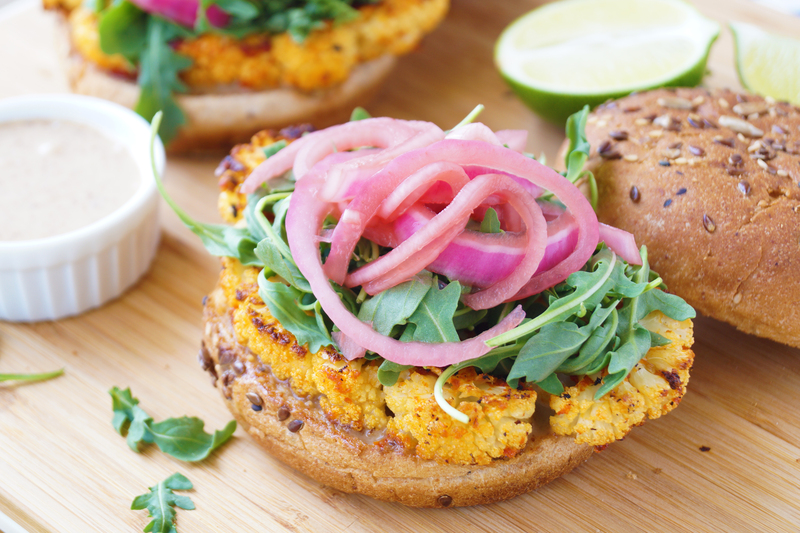 You may be skeptical about a wedge of cauliflower as the “meat” alternative for a burger, however I promise you, your tastebuds will be wowed! The texture of these grilled (or roasted!) cauliflower steaks are spot on. I am also loving the new Million Dollar Buns from Dave’s Killer Bread. I personally feel that most burgers buns are too thick, and the bun to burger ingredient ratio is all off. 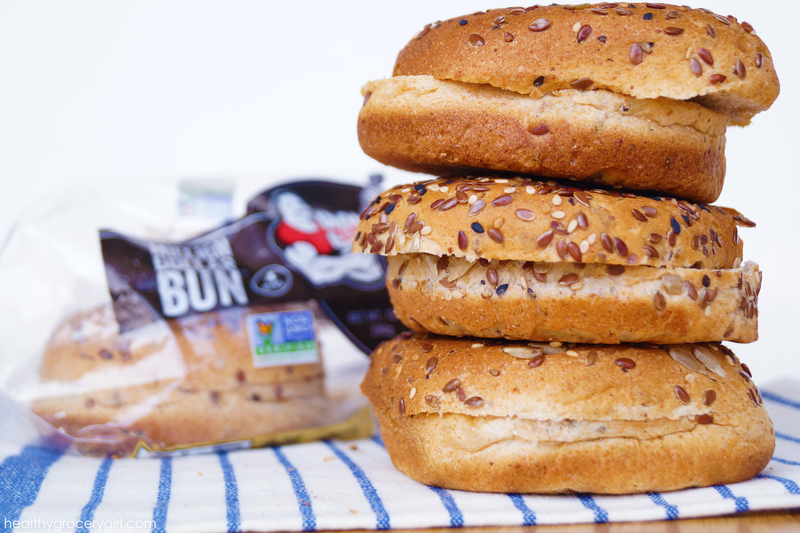 These buns are the perfect thickness and I really love the addition of seeds on top for added texture and flavor. Plus, they are Organic! Gotta love Organic buns. Okay now let’s talk about the Thai Almond Sauce… it’s basically like peanut sauce but with almond butter! It really pulls everything together in this dish. Lastly… a quick pickle for red onions to garnish on top with a handful of arugula, a drizzle of lime juice… come on’! Are you hungry yet? 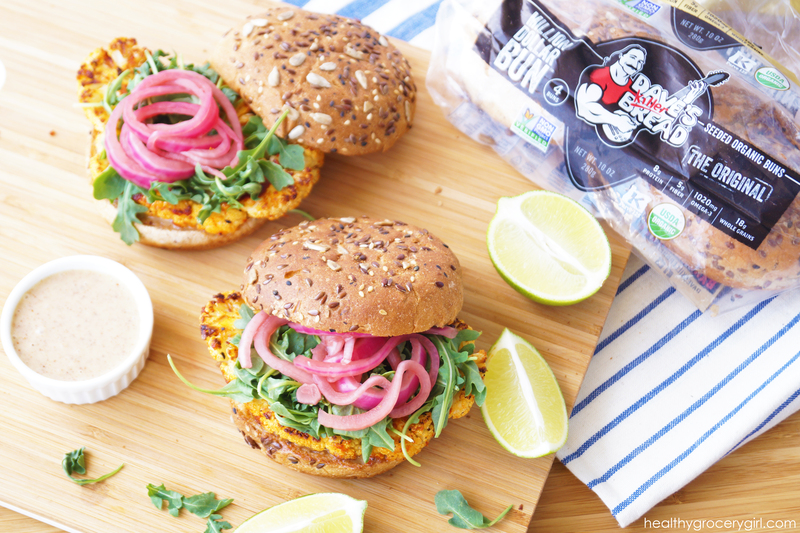 With Father’s Day right around the corner… this is the perfect healthy, fun & delicious recipe! Thanks for stopping by the HGG Blog today! 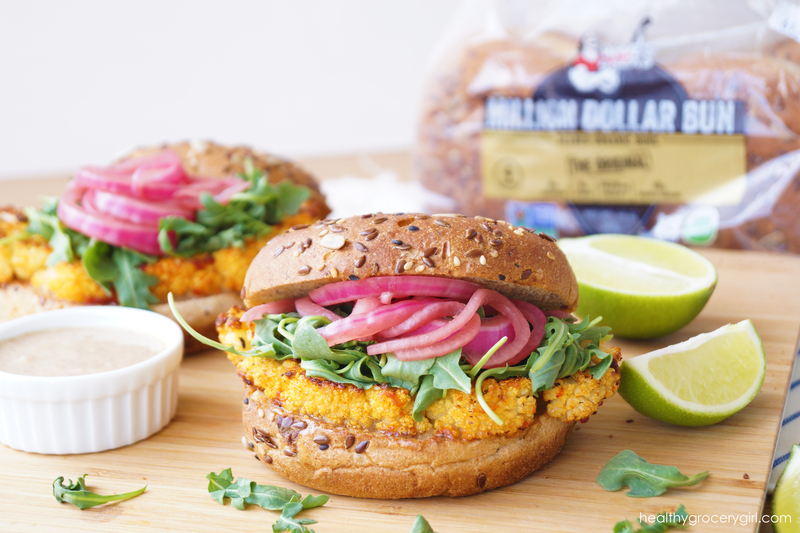 The best cauliflower burger I think you will ever eat! Cut 1/2 red onion into paper thin slices and place in a small heat resistant bowl. Simmer 1/4 cup red vinegar in small pot, pour over red onion, cover bowl with plastic wrap and place in refrigerator. Wash and pick leaves off of cauliflower, turn cauliflower upside down so the stem is sticking up. With a large chef's knife slice down the right side of the stem trimming off one side of florets. Repeat on the left side of the cauliflower. Then slice lengthwise down through the center of the stem, producing two cauliflower "steaks". Mix one tablespoon of chili paste with one tablespoon of coconut oil and with your hands evenly spread all over "steaks". Roast cauliflower steaks on a sheet pan in the oven for 20-25 minutes, until the edges are just beginning to blacken. Do not over cook, cauliflower should just barely be cooked in the the center to provide a hearty texture. Add all ingredients into a blender or bowl and mix together until evenly combined. This sauce will be a little runny at first however will thicken up if you let set in the fridge overnight! You'll have leftover sauce for days too which is nice, it's a great dip for veggies or dollop on a big veggie, bean & rice bowl! Yum! Spread generous layer of almond sauce on the bottom bun, next layer the cauliflower steak. Top steak with arugula and then 'quick-pickled' red onions. Optional, add more almond sauce to top bun, or keep excess sauce on the side for dipping which is my professional recommendation.